For the afternoon, we went to the Kekaha Kai State Park. The road was less than paved and our poor little rental car cried most of the 1/2 mile driveway to the beach. The beach itself was not much to speak of. It reminded me of a rocky, choppy version of Sandy Point (under the Chesapeake Bay Bridge) except that it was surrounded by lava. We walked off to the left of the initial beach, towards the lava, and hiked for about a half mile or so until we came upon the Makole'a black sand beach. It was really cool and as you might expect, the sand was hot. The water was too rough to swim in so we took a break and some pictures before heading back. We came back to the hotel and rested a bit before dinner. Our free Internet stopped working (we had problems with it when we checked in), so we connected through my cell phone. For dinner, we headed to Donatoni's Italian Restaurant at the Hilton Waikoloa Village. 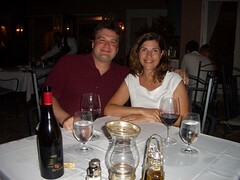 We went with a Zenato Valpolicella 'Ripassa' 2004 (though they had the 2003 in the menu). It came on strong (on the nose), but had a nice, clean finish when drinking. I had a scallops special over risotto with pesto and a balsamic reduction. Holly got chicken marsala (surprise!). The food was good. The Sommelier/manager asked us about our trip to Hawai'i and we mentioned it was our anniversary, so they gave us a complimentary tiramisu. It was a nice ending to a nice dinner. The Hilton is huge. It's segemented into multiple buildings that require a tram ride or boat ride to get from place to place (well, you can walk). As Holly put it, it felt a little like a Vegas hotel where it's its own world (including a small shopping mall). It was difficult to make our way through the hotel and finally make it out to the street to walk back to our hotel. All in all it was a nice day. We're still trying to decide what we're going to do tomorrow... probably something ocean related. Nite.